License4J Floating License Server serves floating licenses created by LICENSE4J License manager. It can run on windows, linux and unix operating systems.The only requirement is Java 1.6 and above. Floating License Server has an installer for Windows, Linux/UNIX version is not an installer file but it is enough to decompress and run a simple script on Linux/UNIX. 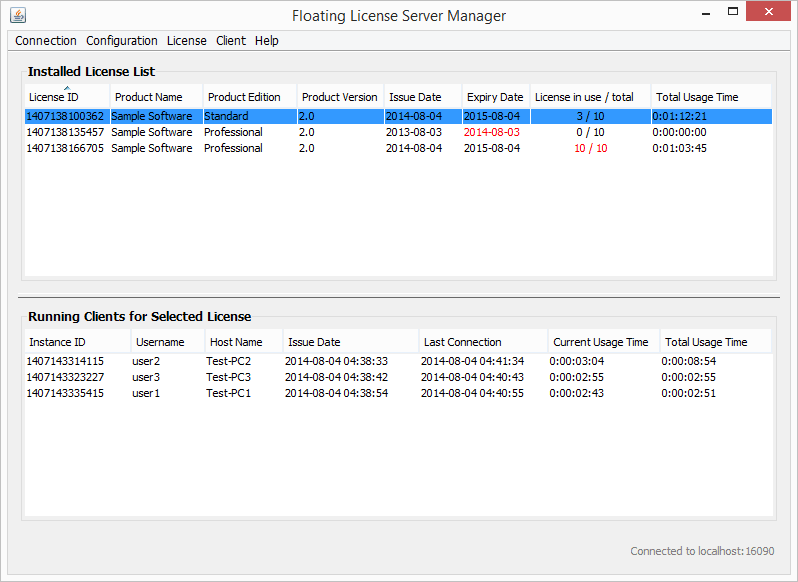 Floating License Server includes two components: licenser server itself and a manager GUI tool. With Floating License Server Manager GUI tool, you can display installed licenses and active users obtained each license separately, configure license server (only on local connections), install and delete licenses, display license details, display floating license server hardware id. Floating License Server Manager GUI can connect and display status and license usage information, so you can monitor your license server remotely. Licenses created with License4J License Manager GUI is used by Floating License Server. All standart features for a license file can be specified in License Manager GUI and can be used as a floating license by just filling in floating license mandatory fields which are license count (concurrent users) and license server hardware id. LICENSE4J Floating License Server is free to use and distribute with your product. You may use and distribute floating license server setup files with your product for installation by your customers. LICENSE4J Floating License Server is free to use and distribute with your product. You may use and distribute floating license server setup files with your product for installation by your customers. END-USER LICENSE AGREEMENT FOR LICENSE4J. IMPORTANT PLEASE READ THE TERMS AND CONDITIONS OF THIS LICENSE AGREEMENT CAREFULLY BEFORE CONTINUING WITH THIS PROGRAM INSTALL AND USE. By installing or using the LICENSE4J (the "Company") product LICENSE4J License Manager (the "Software") you indicate your agreement to the terms of this End User License Agreement (the "Agreement").